Water is almost available in all regions of the world. In right conditions, water can be suitable drilling slurry. Every drilling contractor, at first, will try to apply water as a replacement of drilling slurry if favorable ground condition is found as it is less expensive. The term inexpensive is not used as disposal of it may include some contaminants to be treated. In the past, in many drilling operations water was permitted to use as drilling slurry by contract specifications. History of drilling has demonstrated that selection of water as drilling slurry was not appropriate to use to drill holes through unstable ground which will yield many defects in pile need to be mitigated. The application of water as drilling fluid is limited for ground formation that are considered strong enough not subjected to significant deformation during drilling. The only means to stabilize sides of drilled hole is to keep positive effective stress to sides as water cannot control filtration within drilled holes. Many defects were reported in piles when water is used as drilling fluid, even when fully cased drilling was operated, provided that drilling is terminated in unstable formations. Because of these, water is permitted to use drilling slurry only when casing is provided for entire length of drilled hole. Opinion of the geoprofessional must be taken before selecting it as drilling slurry. California department of transportation has modified the requirement of drilling slurry by stating requirement of special provision to specify water as drilling slurry. Why do contract specifications allow water as drilling slurry? Considering above limitations application of water will produce uncertainty in quality pile production, but still contract specifications permits water. Let’s try to find out the answer. 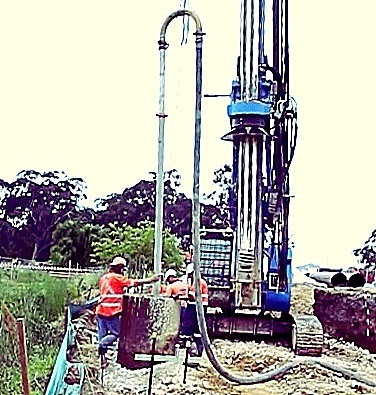 Retaining water to use as drilling slurry (limited use as per by specifications) provide an option to an contractor, who tries to dewater using temporary casing into drilled hole and whatever reason may be he cannot do so, to use water in drilled hole (as drilling slurry) to impede unstable conditions under drilled hole and provide a favorable condition for placement of concrete. Water may be used as drilling slurry in case of application of oscillator or rotator to drill holes, provided that hole should be terminated in instable ground formation. Unlike other variety of drilling slurries, physical properties of this drilling slurry are not so critical; this is due to incapability of water to suspend materials for long periods. This capability of water is hardly 30 minutes in case of keeping sand or silt in suspension. Thus soil cuttings usually settle at the bottom drilled hole moderately quick. Since PH of water is not important and its viscosity is not altered significantly unless contamination is introduced from cutting materials, the contract specifications only set parameters for sand content and density. The satisfactory results from testing these parameters, conforms that most of suspended materials of the water has settled from suspension before wash of drilled hole & concrete placement. The water level is kept at least (6-7) feet above ground water table in the drilled hole.This is the only way to keep positive effective stress along sides of drilled hole. This drilling slurry has advantage of easily disposal onsite provided that all suspended materials appeared in slurry has been settled before disposal and no hazardous materials are not fond in water.